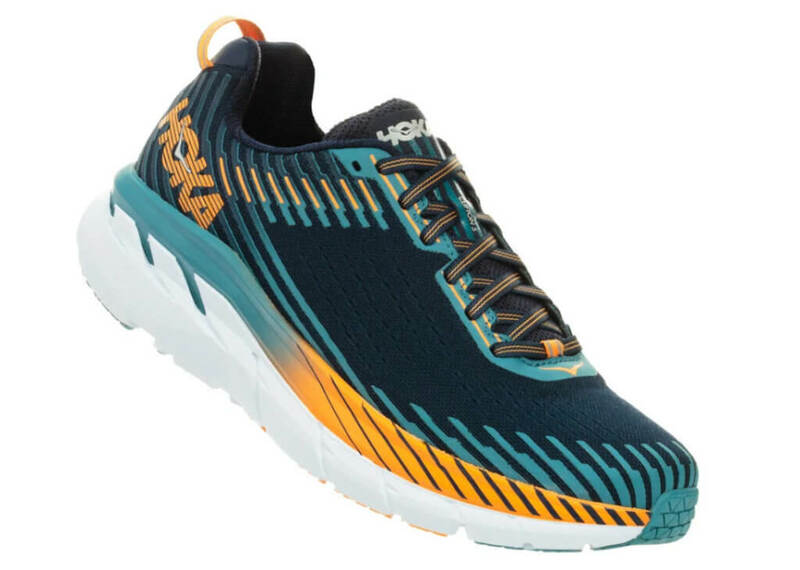 In 2016, HOKA Athlete Pete Kostelnick ran across America to set the fastest-known time running across the country. An accountant from Iowa who found running later in life, Pete ran 3,067 miles across the United States to break a 36-year-old record. Most people would be satisfied with this accomplishment, but he found a way to push his limits even further. 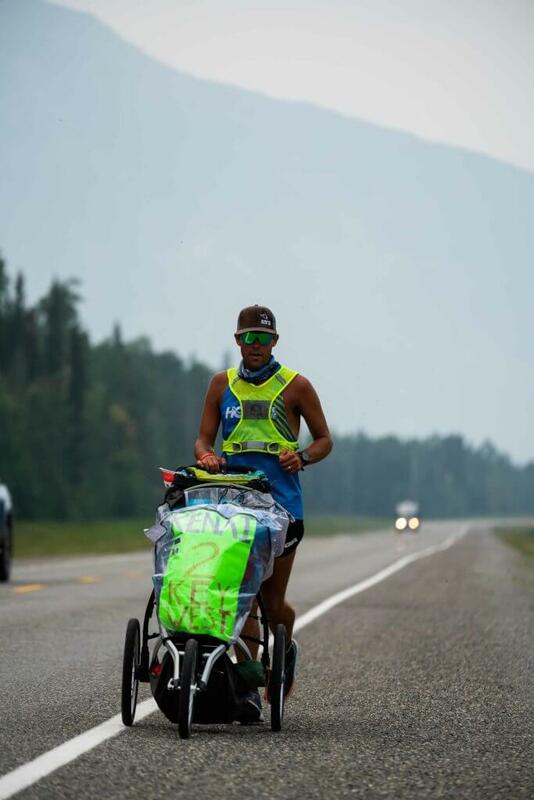 Pete just became the first man to successfully run from Kenai, Alaska to Key West, Florida. His journey followed a 5,384-mile road that spans the two furthest corners of the United States. He completed his run in 98 days for an average of 55.3 miles a day. And to make this challenge even more difficult, Pete ran self-supported and pushed a stroller with everything he needed along the way. 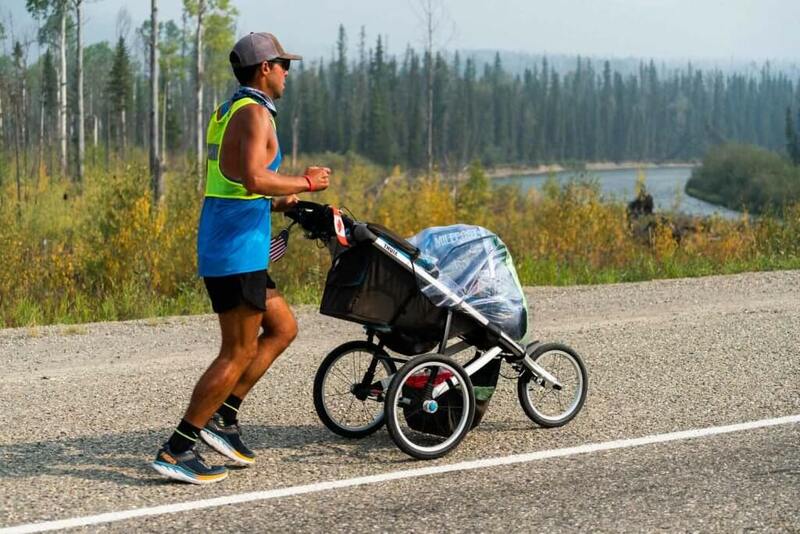 So he packed up his stroller with five outfits, bear spray and some Clifton 5s and Bondi 6s, and he set out on his challenge. Pete’s inspiration for this adventure came from a family road trip to Alaska during his childhood. “We met people who were motorcycling or RVing all the way from Alaska to Florida, and I thought that was really cool. 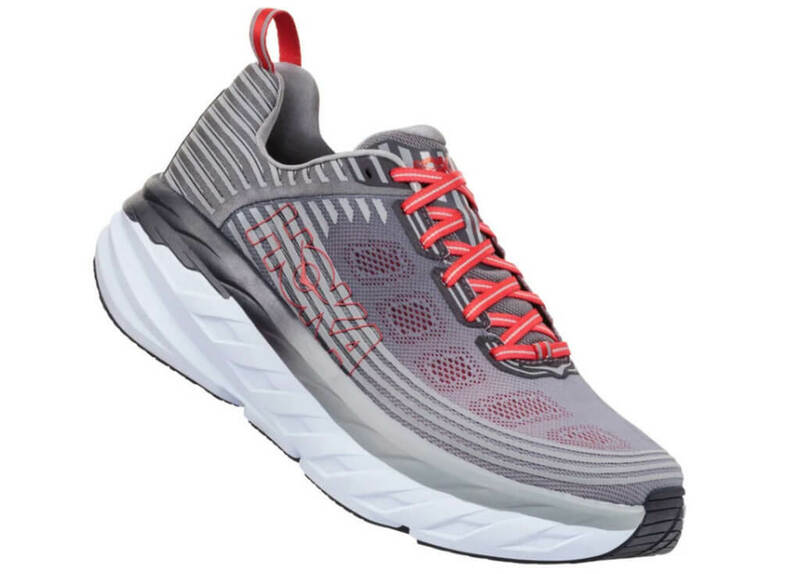 I wasn’t a runner back when I was 11 and definitely not an ultrarunner, but that was where the original thought process was when I was a kid. I found out that people do these adventures from Alaska to Florida, and there is a paved road that goes all the way,” Pete says. Fast forward to when Pete set the speed record for running across America. This achievement gave him confidence, but the experience left him with more to be desired. Running an average of 72 miles a day for 42 days to get from San Francisco to New York City, Pete says he felt a sense of emptiness after he finished. Even though the run went exactly to plan, it was all about speed rather than taking in the journey. “It was run, eat, sleep, repeat. 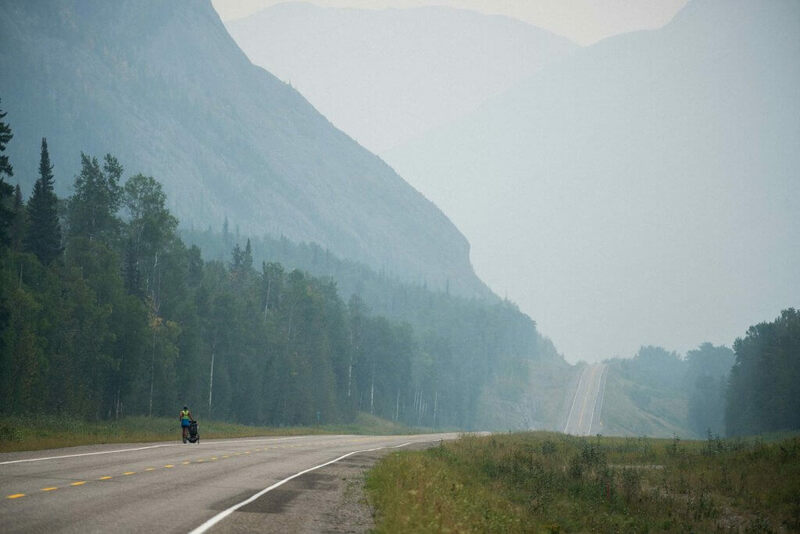 So, I thought, ‘How can I do another run across America and make it just as challenging but enjoy it along the way?’ The only way to do that was to make it longer and do fewer miles per day,” Pete says. Boasting wins at races such as the Badwater 135, Pete is no stranger to long distances. However, this major crossing would include one drastic change for Pete — running self-supported. Logistically, he knew it would be hard to find anyone to join him for 100 days and budget-wise it was a no brainer. But, running self-supported means Pete would have no outside help, need to carry all his own gear, food, water and find his own lodging. This was a huge contrast to his previous transcontinental run, where he had an entire crew dedicated to helping him. Looking back, Pete acknowledges his fears of running self-supported through remote stretches of highway. “I heard so many things about the wildlife in Alaska. That was definitely one of the main things on my mind because you never know going into something like this. I was running on highways that maybe have never had people running on them. If a bear saw me running down the highway, it might just naturally go after me because it’s never seen a human running by them before. That was one of my biggest fears early on because I eventually did see grizzly bears and black bears along the road,” Pete says. However, Pete soon realized that his fear of bears weren’t the most pressing danger, and the reality of being self-supported set in when food was scarce in remote locations. Pete planned extensively for the journey with a detailed spreadsheet of places to stay and eat, but meticulous details weren’t always enough. “There were four or five weeks in Alaska where there were hundreds of miles between towns with any businesses or grocery stores. Typically, I had to eat 7,000-8,000 calories a day. I was living on trail mix and canned chili for so long. I had a giant ziplock bag that I would pour various types of trail mix into. It was a calorie dense way to store food on the stroller. Some days, I ate over half of my calories in the form of trail mix,” Pete says. Other days, Pete was happy to find a Subway sandwich for dinner in a nearby small town. But even when times were tough, Pete kept a positive mindset and never had doubts that he would finish once he got started. “It kind of took me by surprise because I went in telling people that I had no idea how far I was going to make it. I was just going to go until something bad happened. I think back on it now, and I can’t believe how calm and collected I was after a few days on the road. I was just so focused on what I needed to do. Once I got out of Anchorage I was like, ‘Let’s do this. This is the challenge of a lifetime and I’m so excited to take it on,’” Pete says. When it comes to conquering his goals, Pete says his patience is what separates him from others. His mindset is what’s allowed him to excel at these insurmountable challenges. “If I’m moving closer towards a goal, no matter how slowly I’m moving towards it, I have this ability to stay laser focused on it. I think that’s the main thing for something like this. It doesn’t really matter how good of an athlete you are. If you are focused on continuing to move forward and staying positive, it’s possible to reach it,” Pete says. And even despite running alone for 29 days straight during the beginning of his run, Pete was able to keep a positive mindset. “A lot of times when I was alone, it was in very scenic and beautiful areas along the Alaskan highway. I could just run and kind of lose myself in thought,” Pete says. After that initial period, Pete was thankful to have friends join him along the way and managed to find running partners for the majority of the rest of his journey. Yet, his last day, Pete opted to run alone. “Going into the last day, I made sure that it was just me running by myself because I was so excited to use that day to think back on the entire run,” he says. When he finally arrived in the Florida Keys, Pete ran until he literally couldn’t run anymore and dipped his feet into the Atlantic Ocean. Pete now has two formidable records under his belt, so we asked, what’s next on his list? “I’m sure there’s an adventure out there that could be longer, but for me, this was about growing up in the U.S. and loving Alaska and Canada. It really was a story book adventure for me,” Pete says. But, for Pete, this was never about out-doing the record he set two years ago. Although he loves a challenge, he’s in it for the adventure. 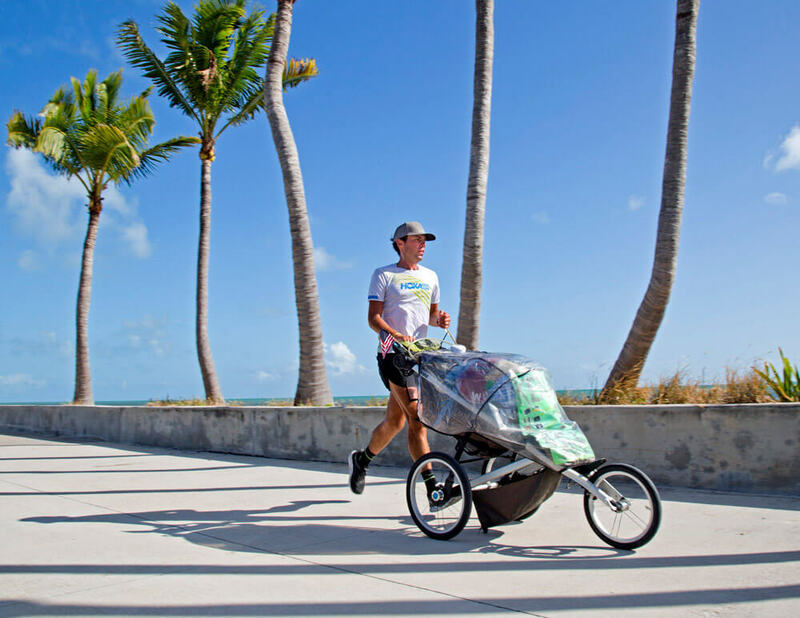 He wants to stop and take pictures, meet the locals and catch up with old friends — even if that means pushing a stroller 5,384 miles across the U.S.
Pete wore the Clifton 5 and Bondi 6 during his Ke2Key run.